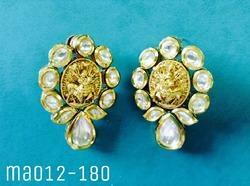 The charm & beauty of Trendy Earrings is centuries old, right from the time of Egyptians. Hence the right pair of earrings always enhance the look of an outfit, when they are enhanced with the perfect craftsmanship. Earrings defines the completeness of the jewelry worn, hence we offer the traditional and the contemporary designs for each piece created, such as designer earrings, traditional earrings, party wear earrings, diamond studs, solitaire earrings, chandeliers, long earrings, pearls earrings. 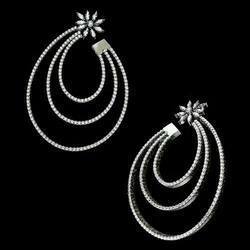 These extra flashy long hoops is all you want to flaunt in your besties wedding, buy now ! 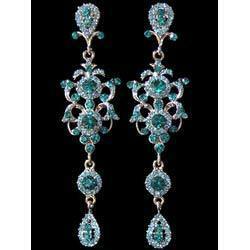 We are into the business of offering our clients with sea green colored Fancy Long Earrings also offered with or without precious and semi-precious stones. 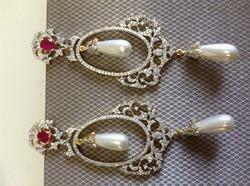 You can also gift it to your loved one and bring home good luck with these earrings.